Arab residents set up tents Wednesday in the northern town of Baqa al-Gharbiyye, thereby joining the nationwide public protest against skyrocketing housing prices in Israel. The activists, including the city's Public Committee and a local youth movement, were also protesting against the destruction of Arab homes and rise of land prices. Posters hung on the tents read: "Instead of overpricing – invest," "Bibi, we too deserve affordable housing," and "Bibi, look at us too." 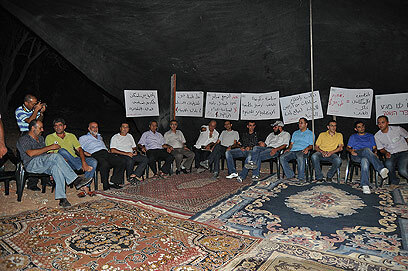 Knesset Members Jamal Zahalka and Mohammad Barakeh visited the town to participated in the demonstration. "We suffer from land shortage and shortage in housing for young couples," said Public Committee Chairman Samich Abu Moch. "We are protesting to convey the message to the government that we are an integral part of this State and we have the right to ensure a better future for our children. So we demand the Interior Ministry provide us with land so we can build apartments." "The government should know that what's good for the Arabs is good for the entire country," he said. "We hope that the Housing and Construction Ministry take into account the housing shortage in the Arab sector as well, or else we'll escalate our protest and take conventional and unconventional measures available under a democratic regime." See all talkbacks "Israel's Arabs join housing protest "